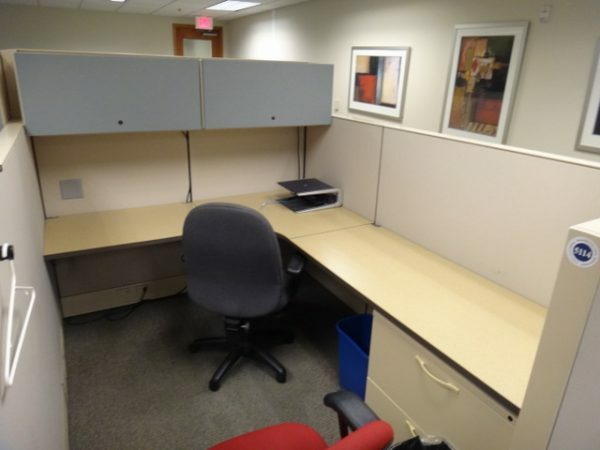 These Herman Miller Q workstations are 6×6 and 6×8 with high to low panels. each station has a 30″ or 36″ 2-drawer lateral file. Worksurfaces: 24×36 corner with 24×36 and/or 24×60 returns. Two fabric covered overhead 36″ bins with task-lights are also included. These neutral stations will compliment any space. If the light blue overheads are the wrong color, they can be easily reupholstered into the right color.